It is a press mold for automotive parts and is used as an auxiliary for fixing scrap chutes and product chutes at shipment. Although it is easy to handle from the site, it is popular, but I think whether it is OK if there are 5 set mouths and 10 set mouths if possible. There are times when it is necessary to use 3 to 4 sets for Type 1 when using a lot, and if it becomes a number type, there will be more garbage if it is packed in one set. I think that it is a waste every time I throw out cardboard that carefully wrote the method of use. This review is about item#34567197. I missed the size, I wanted a 7 ハ eyelet strap stopper, but the purchased product was for the bicycle carrier. This review is about item#34567154. I use it through a rubber rope. Sometimes the rubber rope gets dislocated from the gap of the metal fitting so it will be better if it improves. This review is about item#34567181. It was possible to use it with a rubber rope width of 19 mm for the truck monoterror truck, but if you use it with a motorcycle, it is better for the hook to be thinner. 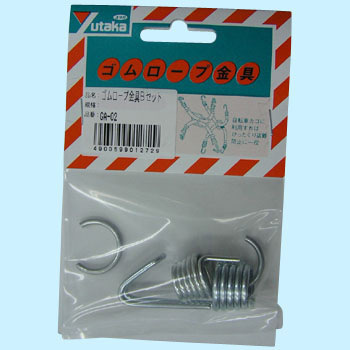 Now it is 100 yen shop hook and further adjustable men monotachu truck rubber rope metal fittings set metal clasp set I use it in combination. In the meantime for now I am not using this item at the main. This review is about item#34567136. I use a body cover on a car and use a rubber belt on it to prevent the cover from being blown by the wind, but I want a little more variations. Just bending with pliers, you could install without problems. It was possible to use it normally, because it seems easier to use a hook thinner to use it on a motorcycle, it may be better to buy a thin hook separately and caulk with just the parts that caulk. Usability is good, but strength is somewhat short.